Going to the Moon? Be careful. A new kind of solar storm can take you by surprise. June 10, 2005: January 2005 was a stormy month--in space. With little warning, a giant spot materialized on the sun and started exploding. Between January 15th and 19th, sunspot 720 produced four powerful solar flares. When it exploded a fifth time on January 20th, onlookers were not surprised. They should have been. Researchers realize now that the January 20th blast was something special. It has shaken the foundations of space weather theory and, possibly, changed the way astronauts are going to operate when they return to the Moon. Sunspot 720 unleashed a new kind of solar storm. Scant minutes after the January 20th flare, a swarm of high-speed protons surrounded Earth and the Moon. Thirty minutes later, the most intense proton storm in decades was underway. "We've been hit by strong proton storms before, but [never so quickly]," says solar physicist Robert Lin of UC Berkeley. "Proton storms normally develop hours or even days after a flare." This one began in minutes. Proton storms cause all kinds of problems. They interfere with ham radio communications. They zap satellites, causing short circuits and computer reboots. Worst of all, they can penetrate the skin of space suits and make astronauts feel sick. "An astronaut on the Moon, caught outdoors on January 20th, would have had almost no time to dash for shelter," says Lin. The storm came fast and "hard," with proton energies exceeding 100 million electron volts. These are the kind of high-energy particles that can do damage to human cells and tissue. "The last time we saw a storm like this was in February 1956." The details of that event are uncertain, though, because it happened before the Space Age. "There were no satellites watching the sun." It begins with an explosion, usually above a sunspot. Sunspots are places where strong magnetic fields poke through the surface of the Sun. For reasons no one completely understands, these fields can become unstable and explode, unleashing as much energy as 10 billion hydrogen bombs. From Earth we see a flash of light and X-rays. This is the "solar flare," and it's the first sign that an explosion has occurred. Light from the flare reaches Earth in only 8 minutes. Above: Sunspot 720 erupting on Jan. 15th, photographed by Jack Newton. Next, if the explosion is powerful enough, a billion-ton cloud of gas billows away from the blast site. This is the coronal mass ejection or "CME." CMEs are relatively slow. Even the fastest ones, traveling one to two thousand km/s, take a day or so to reach Earth. You know a CME has just arrived when you see auroras in the sky. En route to Earth, CMEs plow through a lot of gaseous material, first in the sun's atmosphere and then out in interplanetary space. You thought space was empty? No. The void between planets is filled with protons and other particles from the solar wind. Shock waves in front of the CME can accelerate these protons in our direction--hence the proton storm. "CMEs can account for most proton storms," says Lin, but not the proton storm of January 20th. According to theory, CMEs can't push material to Earth quickly enough. Back to the drawing board: If a CME didn't accelerate the protons, what did? "We have an important clue," says Lin. 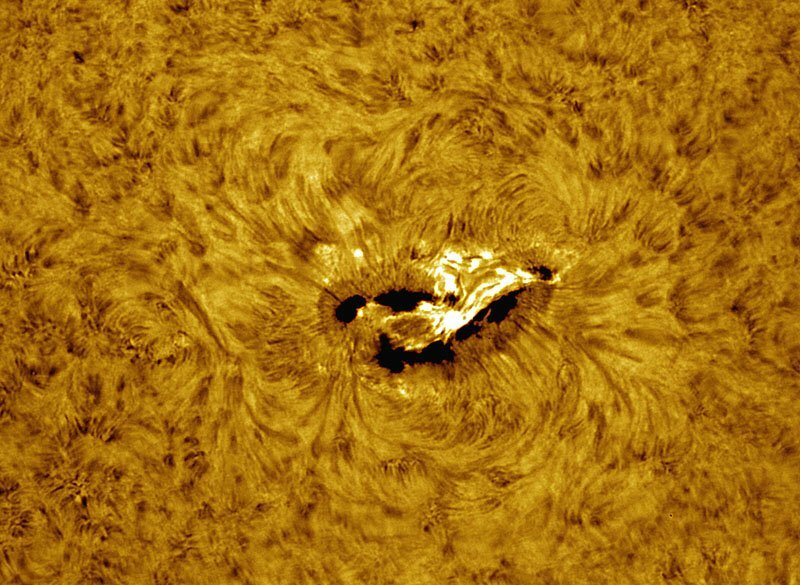 When the explosion occurred, sunspot 720 was located at a special place on the sun: 60o west longitude. This means "the sunspot was magnetically connected to Earth." He explains: The sun's magnetic field spirals out into the solar system like water from a lawn sprinkler. (Why? The sun spins like a lawn sprinkler does.) The magnetic field emerging from solar longitude 60o W bends around and intersects Earth. Protons are guided by magnetic force fields so, on January 20th, there was a superhighway for protons leading all the way from sunspot 720 to our planet. "That's how the protons got here," speculates Lin. How they were accelerated, however, remains a mystery. What does all this mean for astronauts? Stay inside when there's a big sunspot located near solar longitude 60o W. Or, if you must go moonwalking, take a radiation shelter with you. It's not as hard as it sounds. Stay tuned for more on this topic in an upcoming Science@NASA story, "Radiation Shelters: Don't Leave Home Without One." Editor's Note: The look and feel of Science@NASA stories is about to change. We're adopting the style of the NASA Portal. Please take a look and let us know what you think. The Science Directorate at NASA's Marshall Space Flight Center sponsors the Science@NASA web sites. The mission of Science@NASA is to help the public understand how exciting NASA research is and to help NASA scientists fulfill their outreach responsibilities. Sickening Solar Flares -- (Science@NASA) NASA researchers discuss what a big proton storm might do to someone on the Moon. Mysterious Cancer -- (Science@NASA) Researchers agree that space radiation can cause cancer. They're just not sure how. The Biggest Explosions in the Solar System -- (Science@NASA) NASA's RHESSI spacecraft aims to solve an explosive riddle: the origin of solar flares. Robert Lin is the principle investigator of this mission. Solar Longitude: Near the end of this story, we learn that sunspot 720 was located at 60o W solar longitude. What is solar longitude? Astronomers use solar latitude and longitude to specify the location of sunspots on the surface of the sun. Zero degrees solar longitude defines a line running north-south through the center of the sun's disk as seen from Earth. This is the sun's central meridian. 60o W solar longitude is a similar line 60 degrees west of the sun's central meridian. Although the sun rotates, once every 27 days, these longitude markings remain fixed with respect to an observer on Earth. Join our growing list of subscribers - sign up for our es delivery and you will receive a mail message every time we post a new story!! !